This term started with a still life drawing activity with the children from year one to seven. I set up a selection of objects, some of which were used in our centenary cook book. Some of these drawings will be used for our big projection art work at the end of the year on our open day. But most importantly these drawings formed the beginning of the process in developing our own still life projects. 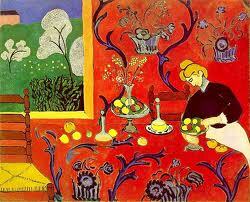 The year one and two and some threes will be focusing on Matisse's work with his beautiful use of colour and pattern. The children explored pattern by looking at Matisse's work and experimenting with some of their own patterns. They used these to create some "wallpaper" which became the base for a collage art work, using maths room 2D shapes and templates I made to help them create large simple shapes to represent plates and fruit etc for their still life design. The students were encouraged to explore their ideas by arranging and rearranging their cut out pieces before gluing them down. Some of them worked really well.